The Department of Tourism and the Fishermen’s Guild have joined together to create and present a joint project in which they will be working hand in hand with consultation company ‘Feel and Trip’ to open up the world of commercial fishing to the public. It is an initiative related to experiential tourism which allows those interested to take part and be directly involved in the industry from departure from the port in the early morning, experiencing life on board including its many jobs and ultimately the reward of being able to sample some of the fresh fish and seafood that has been caught during this special day. 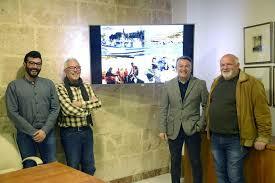 The idea of a fishing tourism project was established in the last ‘Xàbia Mediterranean Fórum’ on sustainable tourism, and forms part of the town’s commitment to sustainability, opening up the port to another form of tourism which offers cultural immersion as well as respect for the natural environment. In addition the project will place an added value of the local fishing industry, helping to make the primary sector more profitable. Mayor Chulvi explained that the town needed a living port, open and active, which was why the idea was proposed to the fishing industry to place Xàbia as a unique tourist destination and boost the local economy. Twenty people (five crews) are already being trained to be part of ‘Pesca Turismo’, funded by the Ayuntamiento de Xàbia to the tune of 9,000 euros.